The Book Thief has been on the reading list for a while, so I was happy to see it assigned for my class. However, I was doubtful that I could read it all in less than a week so I checked out the audio version from the library. Like Noah Galvin in The Perks of Being a Wallflower Allan Corduner does a marvelous job narrating. So much so that there was a small end of the world crisis when disc two skipped and I had a melt down when I missed 10 seconds of the story. I ran to the computer like a mad woman, purchased the digital audio version, and all became right with the world. 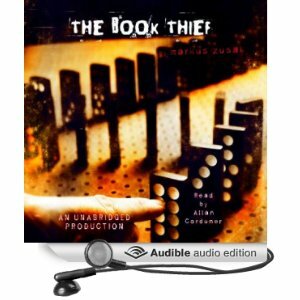 If you have already read The Book Thief, I highly, extremely, very much recommend that you listen to the audio book. Corduner really does an outstanding job. Now and forever, Death will sound like Corduner. Some important information, this novel is narrated by Death. What else can I say without spoiling the magic that is The Book Thief? Not much. This is a wonderfully written, compelling, and laugh out loud funny book. It is one of my favorite books of all time, probably because of all the German profanity. This entry was posted in Adult Fiction, Young Adult and tagged Allan Corduner, Markus Zusak, The Book Thief, World War II. Bookmark the permalink.